some incredibly stupid questions and had some bizarre conversations. "I’ve written a novel and everyone tells me it’s a script," one woman said. "How do I turn it into a script?" "Well, you write a script." I said. She stared at me. "How do I do that?" "You get a book or take a course, learn the principles of screenwriting, and then you write a script." "That’s too much work," she said. "Isn’t there software that can do all of that for me?" "Yeah," I said. "The same way Microsoft Word wrote your book for you." Another person came up to me and asked me if I wrote for television. I said yes. She then asked, "How do you do that?" "You mean, how do I write for television?" "I write screenplays," I said. "The story, the action, the words that the characters say," I replied. She stared at me. "Somebody writes that?" writing a play, only for the camera instead of a theatre audience." She shook her head. "No, it’s not." "I’ve written a book but everyone tells me it s a TV series," the man said. "How do I make it into a TV series." me. I got stared at a lot today. Hee said: "How can I get around that?" "Because I’m smarter and more talented than they are," he said. "It’s not going to happen," I said. "Is it because I’m black?" he said. "That’s it, isn’t it. It’s because I’m black." "Did you have to sleep with a lot of people to get into TV?" a woman asked me. "Just my wife," I said. "You were lucky it wasn’t someone else," she said and walked away. stories that are told well." "Oh," she said. "That’s going to make it a lot harder to sell." "But my talent is character and I’m brilliant with dialogue," he said. "I really don’t know how to plot a mystery." "Then don’t write a mystery," I said. "But that’s what’s selling," he said. "Don’t try to write what’s selling," I said. "Write what you enjoy. Write the story you want to tell." "The thing is, I don’t know how to tell stories," he said. "But I write killer dialogue. Is a story really necessary?" 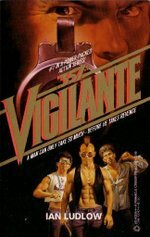 "It takes place in a futuristic L.A.," I said to the man in the "V" uniform who’d stopped to handle the book. "Only illegal ones," I said. When I was 14, I thought this was a pretty funny thing to say. "I only read books with real aliens in them," he said, setting the book down. "You’re an idiot," my sister said from behind her magazine. It was the first time Linda had spoken for at least an hour. "Pardon me?" the man said. "You said you only read books with `real aliens’ in them and I said that you’re an idiot," Linda said, still not looking up. "You’re very rude," he said. "’V’ was canceled," Linda said, "just FYI." He forgot to mention in the column that both he and Linda contracted chicken pox at the convention. I came out unscathed. My brother and sister, sadly, were emotionally scarred for life. 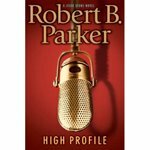 I read HIGH PROFILE, Robert B. Parker’s new Jesse Stone novel, today in about three hours. The book has got to be maybe 50,000 words, tops. No wonder he can write four books a year. It barely qualifies, word count wise, as a novel and they’ve got guts asking $25 for it. Even so, there’s a rhythm to Parker’s writing that I enjoy, even in his bad books. This wasn’t one of the bad ones but it wasn’t one of the good ones, either. The plotting was weak, the description sparse, and the dialog less punchy that usual. But at least Jesse Stone was more or less the character he once was before Parker emasculated him in BLUE SCREEN, the last Sunny Randall novel that is, perhaps, the author’s worst book ever. 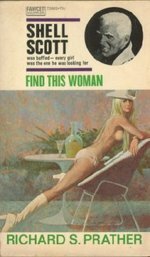 I really enjoyed the last three standalones Parker wrote — GUNMAN’S RHAPSODY, DOUBLE PLAY and APPALOOSA — but his last few "series" novels have been disappointments. The last good one was STONE COLD, a Jesse Stone novel. I wonder if he wouldn’t do himself, his readers, and his regular characters a big favor by resting his various series for a while (and forgetting about Sunny Randall altogether) and doing a few more standalones. My six-hour Archive of American Television video interview with legendary writer/producer Roy Huggins is now up on Google Video. The interview was conducted back in 1998, not long before Roy’s death. Roy created and produced such series as MAVERICK, 77 SUNSET STRIP, THE FUGITIVE and THE ROCKFORD FILES…and was Stephen J. Cannell’s mentor in the business. He was a mentor of mine, too. I put myself through college as a freelance journalist. I snagged an assignment from a magazine to do an article on the complete history of the TV series MAVERICK. So I tracked Roy down at Warner Brothers, where he’d just been fired as showrunner of the BLUE THUNDER TV series. His misfortune was my good luck — he had time on his hands. He invited me down to the studio and, over the next several weeks, screened every single episode of MAVERICK for me, giving me a running commentary. And each day he’d take me to lunch and tell me stories about his days in TV. I was in TV heaven. I couldn’t believe it. A few years later, I interviewed him again at length for Electronic Media magazine (now known as Television Age). He was the showrunner of HUNTER at the time, working for apprentice Steve Cannell. And not long after that, I became a TV writer and actually ended up as a story editor on HUNTER. The first thing I did was give Roy a call to share with him my pleasure (and astonishment) that I’d gone from being a "Roy Huggins fan" to writing on a show that he’d produced. He was very happy for me and gave me some good advice about dealing with the various people he knew who were still working on the show. I told him I hoped we’d get a chance to work together some day. Sadly, that day never came. But we stayed in touch and I was thrilled to have the chance to interview him for the Academy of Television Arts & Sciences’ Archive of American Television. A reader tipped me to the Mystery Lady, who posts her reviews on YouTube. Apparently this post has been up a while…she reviews my book MR. MONK GOES TO THE FIRE HOUSE and Paul Levine’s SOLOMAN AND LORD. I’m heading off to Burbank this morning to tape two episodes of the TV show INSIDER EXCLUSIVE, hosted by Steve Murphy. I’m going to be on with famed criminal defense attorney Thomas Messerau. It seems like an odd-pairing to me. I feel like I should say that I am not guilty and let him do all the talking. Past authors on Steve’s show include Michael Connelly, Danielle Steele, Linda Fairstein, Joseph Wambaugh, David Baldacci, Scott Turow and Jonathan Kellerman, so I am in good company. A few weeks back, I was a guest on Steve’s syndicated radio show and had a great time, so I’m sure things will work out. muddy gray. They were sort of Dorian gray.” Always’s Leave’em Dying. (Via Bookslut and my brother Tod). I thought I knew a lot about promoting my books online. It turns out I was wrong. 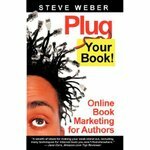 I recently received a review copy of Steve Weber’s PLUG YOUR BOOK: ONLINE BOOK MARKETING FOR AUTHORS and while it told me a lot I already knew, he provides plenty of good advice, many useful short-cuts, and lots of real-world examples drawn from all over the web. My only quibble is that he gives too much emphasis to Amazon, their reader reviews, and their sales rankings than I think they merit (Weber wisely urges authors to stay away from hiring a service to boost their Amazon rankings and gives evidence why it’s a foolhardy investment). Quibbles aside, there’s no doubt that his promotional strategies genuinely work…here I am, a blogger plugging his book online.